“I really wanted to protect even just this one tree,” said Ms Abe Mayumi, of Niidate in Ishinomaki City. 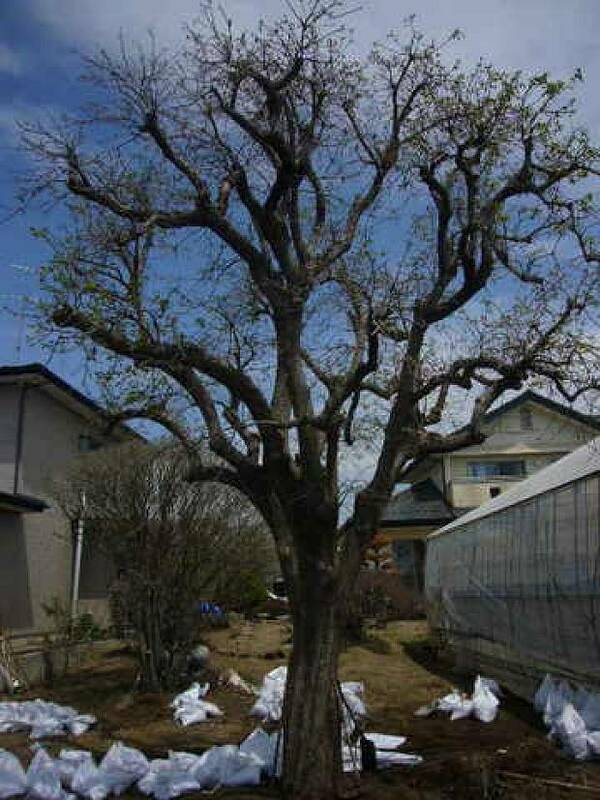 Nine cars were piled up in the large persimmon tree during the tsunami, however because of this tree her house was not swept away, and there was minimal damage to the walls. It was as if the tree protected the Abe’s house and family. The tsunami led to two metre high levels of water in and around the Abe home, destroying their garden and greenhouse and all of their produce including cucumbers. The passenger in the first car to be swept into the tree was able to climb out onto the tree branches and be saved, yet tragically noone in the following eight cars survived. The plastic greenhouse in front of their home was also pushed by the tsunami waves, and a great hole was formed in the side. When the waves subsided, Ms Abe found the body of a young primary school child who had passed away in the greenhouse. Soon after, the mother of the child visited Ms Abe, thanking her for finding her child’s body – a heart-wrenching moment Ms Abe will never forget. It is now two and a half months since the disaster. The pile of cars and debris has finally been removed, and the persimmon tree can once again be seen. 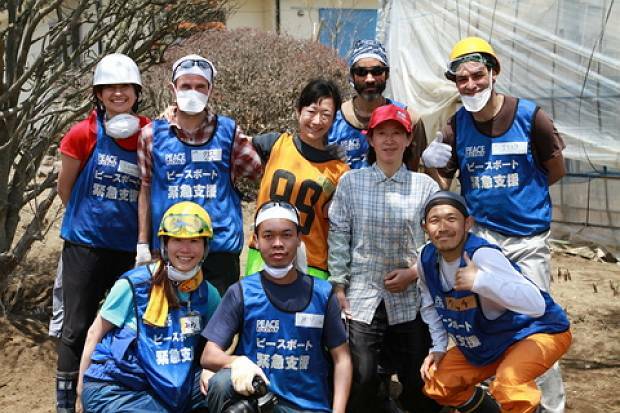 A Peace Boat mud clearing team is now working together with the Abe family to clear the mud and debris from under their house and their yard. The first job is to remove the black tsunami mud, thick like tar. 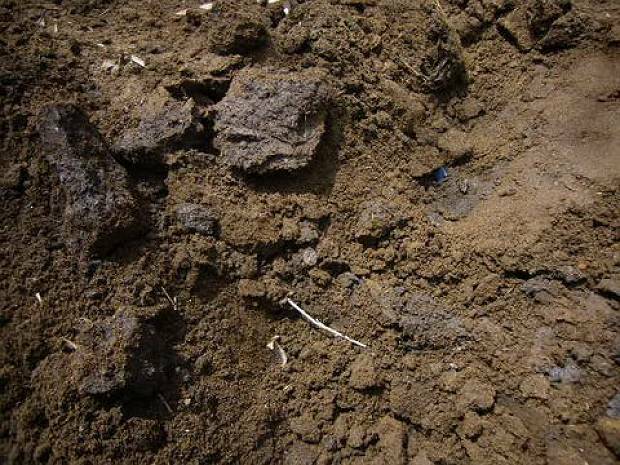 Without removing this tar-like mud, water cannot properly seep into the soil. After removing the mud and the seawater and ocean debris mixed up in it, the rain falling in the upcoming rainy season will clear the soil to an extent, making it possible for the tree to once again bear fruit. The team allocated to work at the Abe house was made up of members not only from Japan but also from the US, Indonesia, France and Canada – some of whom live in Japan and thus speak fluent Japanese. Once speaking with Ms Abe and learning her story, the volunteers were aware of the importance of their work not just as mud removal, but being of much deeper significance. First, the volunteers shovel the mud surrounding the persimmon tree and fill it into sandbags. Around 4 shovel loads will fill a bag halfway, however any more than that and it will be too heavy to move. Thus, the bags are half filled and carried in a wheelbarrow. Although such work would be neverending if carried out alone, through the cooperation of the volunteers as a team, progress is surprisingly fast. This tree was actually moved to its current location five years ago when the house underwent renovations. In the first two years after its move, no fruit grew. After three years it started to bloom, and in the fourth year it finally bore fruit. Last year, the fifth year, no fruit appeared, and right at the season it was starting to bloom this year the tsunami hit. As in the Japanese saying that “it often takes time to bear the fruit of one’s actions; planted peach and chestnut seeds take three years to bear fruit, persimmons take eight,” despite all it has been through the tree this year has once again started to bloom. 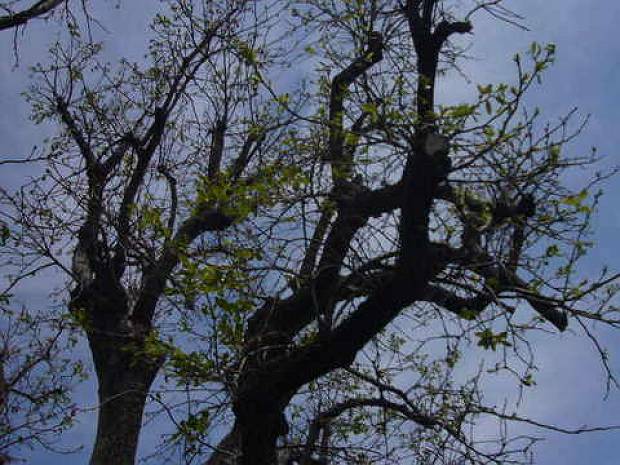 This tree is an ancient tree, that had been at the family home since Abe-san’s grandfather’s time. Just before Ms Abe’s father passed away several years ago, he also told his family, “please take care of that tree.” It is almost like a guardian spirit of the Abe family, of great importance to them. On completion of the clearance, the volunteer team promised Ms Abe to come back to Ishinomaki next time to together eat the cucumber and persimmons from the garden.